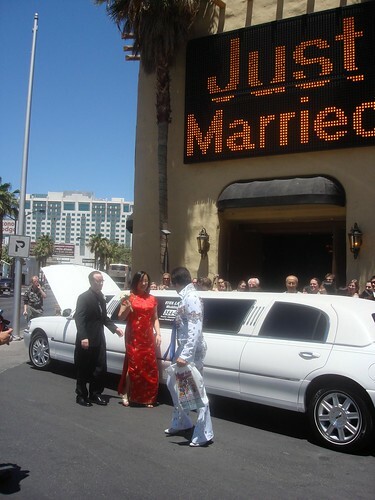 As you might have suspected, I travelled to Vegas for Debbie’s wedding by an Elvis. The ceremony was fantastic and certainly the highlight of my stay. 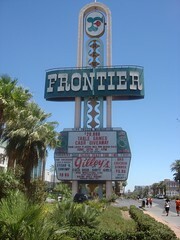 When we arrived at the Frontier, we discovered that it is closing in two weeks. This made for a general sense of impending doom around our hotel, so that was a bit depressing. 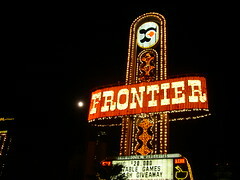 Nonetheless, I was happy to admire the old decor and awesome neon sign before it is gone. It is possible that I am a bit of a curse, since the Westward Ho faced the same fate shortly after my first visit. 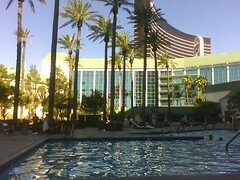 I felt so vegasy sitting by the pool in 100 degree heat looking at palm trees and casinos (and no, I did not get in). I also did a tiny bit of knitting (some by the pool). 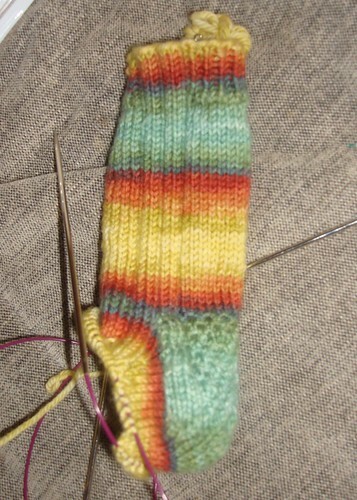 Socks from the top down of my own design for my lovely Twisted sock yarn. I am definitely reconsidering the idea of socks from the top down. Thinking of knitting on vacation? i just noticed that the new Stash and Burn podcast is about just that. Check it out! 4 Responses to "Vegas Trip"
Hmm, maybe you need to start visiting some of the really horrendous hotels instead of the funky retro ones. 😉 It looked like a lot of fun! What are you reconsidering about top down? The colorway is ‘Portal’ and I am using her DK weight yarn (Duchess). Go get some! love the sock…and the Vegas photos. When I’m vegas, I feel like a termite, always scurrying around indoors!